Exchanging Grooms now in Print! Pentas Flowers for Butterflies and Hummingbirds! Last year these annual pentas grew huge and the butterflies and hummingbirds loved them. I planted them between holly, figuring they would give some color while the holly were filling in. But the flowers filled in nicely and they attracted butterflies and hummingbirds, an added attraction. So I wasn’t sure if I could plant them this year because the holly are bigger now. But then I figured, sure, why not? I planted them in front and behind, instead of in between and in one corner where I have non-flowering tulips, and one bearded iris is beginning to show up. Max, my white Havanese pulled up one of the irises, and I had to chase him down to plant it back in the ground. They like to pull up grass and chew on pieces, so to him, it was just a dead piece of grass. NOT. And Exchanging Grooms is now available in print! Lisa Robbins has one mission in mind–sell back her UNUSED wedding dress to the wedding shop, but when she has no success, maybe she’s going about this all wrong. Peter Crawford is intrigued by the woman who has somehow hooked Dallas’s most eligible confirmed bachelor, Pembrooke Hastings, Peter’s staunchest enemy. Not only had she gotten a commitment from him, but she left HIM standing at the altar. Dating the vivacious woman certainly appeals and Peter wants to know just how she hooked Pembrooke, but also why she didn’t marry him. Lisa Robbins is not dating and not marrying anyone, so she assures herself, her family, and her boss. But when Peter takes an interest in her, she’s wondering just what to do about Dallas’s most eligible confirmed bachelor number two, when he just won’t take no for an answer. Now you can understand why a bridal shop wouldn’t take back a “used” wedding gown, but really, if it hasn’t been altered or worn??? March is Women’s History Month...31 days to honor trailblazing ladies. Here are just a few to inspire you! Julia Morgan – First woman architect licensed to practice in California (1898). Known for her work on Hearst Castle. Aretha Franklin – First woman inducted to the Rock & Roll Hall of Fame (1987). The Queen of Soul has 18 Grammys. Frances Perkins – First woman member of a Presidential Cabinet (1933). She served as Secretary of Labor under President Roosevelt. Betty Mae Tiger Jumper – First woman tribal chief in North America (1967). She was elected chairperson of the Seminole Tribe. Anna Bissell – First woman CEO in the United States (1898). Her husband invented the Bissell carpet sweeper, but she ran the company. Norma Yaeger – First woman allowed on the floor of the New York Stock Exchange (1962). Junko Tabei – First woman to reach the summit of Mt. Everest (1975) at age 35. Janet Guthrie – First woman to compete in the Indy 500 and Daytona 500 races (1977). Stephanie Ready – First woman to coach a men’s professional sports team (2001). Jacqueline Cochran – First woman to break the sound barrier (1953). She holds more speed and distance records for flying than anyone in history! Valentina Tereshkova – First woman to travel in space (1963) as a Russian cosmonaut. The list of talented women is endless (and I’m including you & me here), so in March, let’s hear it for the ladies! 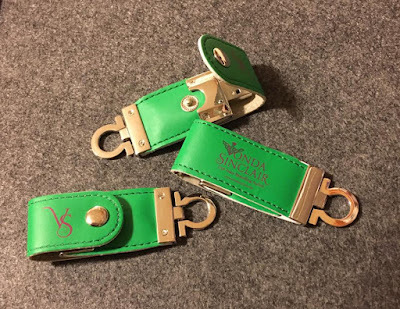 I received these new promotional items, USB flash drives, from USB Memory Direct and I absolutely love them. They're the cutest and most unique design I've seen. I love how my new logos look on them. Click here to view all their designs from classic to creative. This is the Butterfly design which is made of excellent quality leather and metal. These have a high-end, designer look. Here are a few more promotional items I've given away in the past. 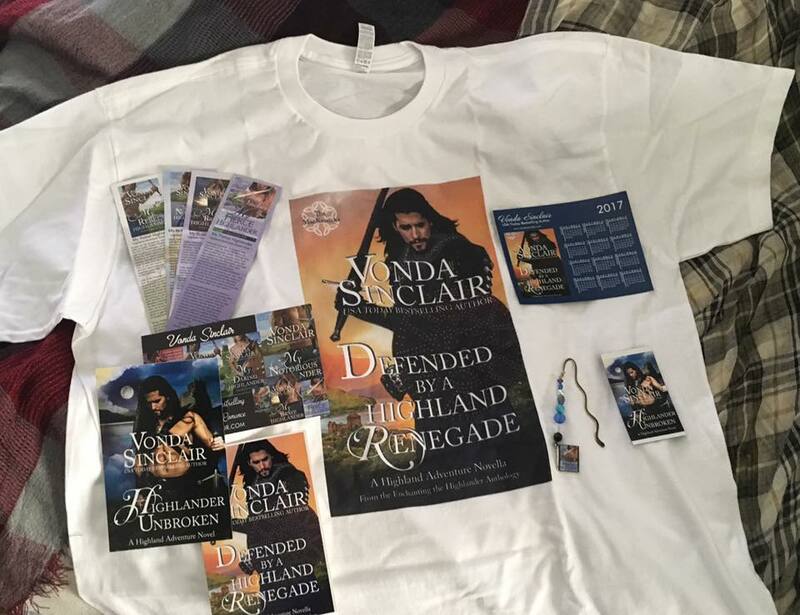 T-shirts, magnetic calendars, bookmarks, postcards, handmade beaded bookmarks, cover magnets and tote bags. 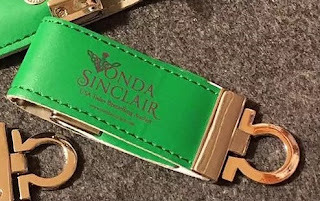 As a reader, what are your favorite promotional items that you actually use? If you're an author, what type of promotional items do you like to give away? Enter to win one of my new flashdrives on my FaceBook page. Wouldn't you like some HOT SILVER NIGHTS? 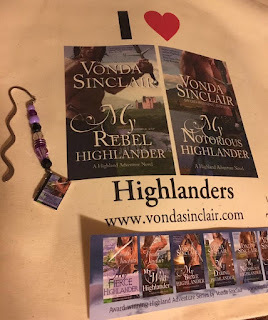 Where are the romance books about older people like me? They’re right here! Join us in the celebration of love later on in life. 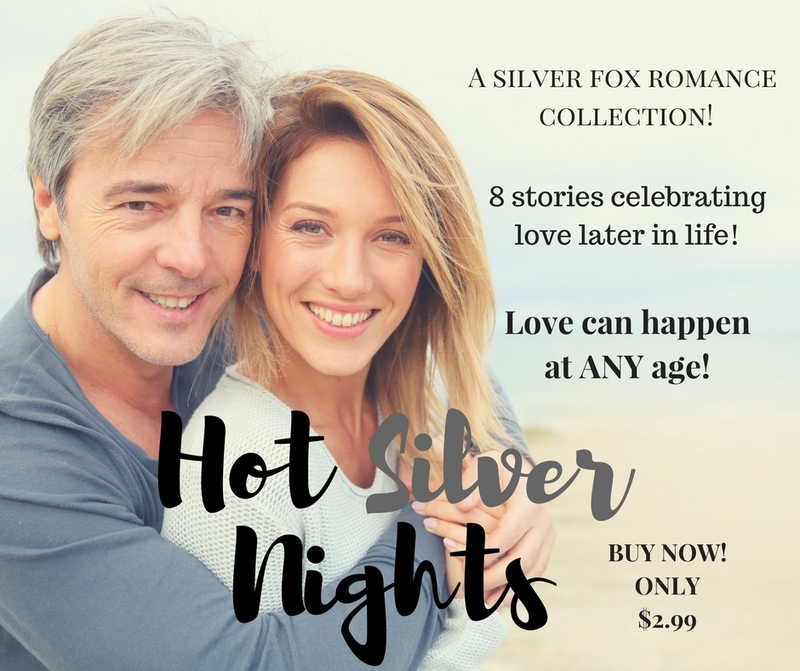 We won’t let the fine lines of time interfere with the joy and happiness romance can bring, so sit back and relax with stories from USA Today bestselling authors in the Hot Silver Nights collection. 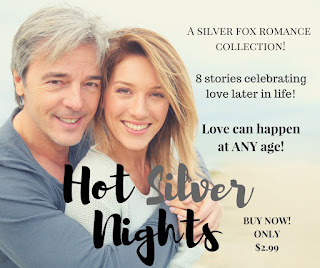 My contribution, Lucky Me, is part of my Silver Fox Romance series, but like all the other books, can be read as a standalone. 8 stories for only $2.99! How can you go wrong? 99 Cents! Alpha Wolf Need Not Apply! Next up is Sarandon Silver’s story. So I need to figure out what I’m going to write on that one. And I need to proof Galaxy Warrior’s print book. My daughter is due any day now and so I thought while I’m waiting on her to have the baby, it would make for a great time to proof the book. Or not. 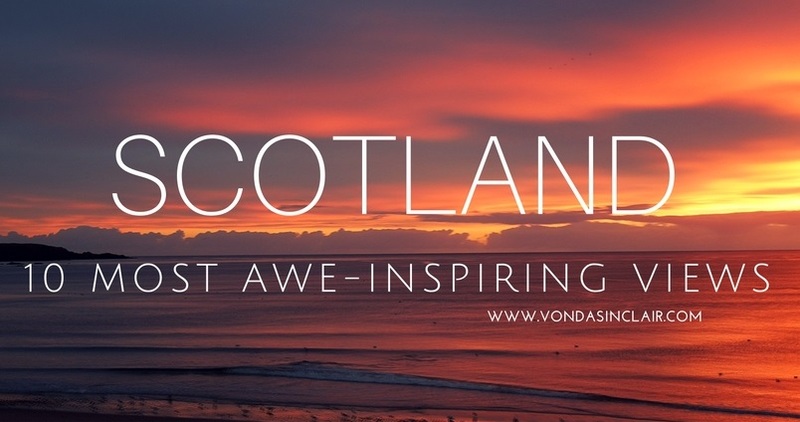 Almost everywhere you stop and look in Scotland, you'll find an awe-inspiring view. But here are 10 of my favorites. Corrieshalloch Gorge in Ross-shire is approximately ten miles south of Ullapool. The focus of this site is the waterfall and gorge which are amazing, but the view down over Strath Broom to Loch Broom is simply stunning, especially with the wildflowers in the foreground. I recommend this site as a wonderful place to walk through nature. Eilean Donan Castle is surrounded by three lochs--Loch Duich, Loch Alsh and Loch Long. It is easy to see whether the tide is in or out, depending on the level of the water under the bridge. The castle is most beautiful and picturesque when the tide is in and the castle reflects in the water. There is evidence that the island has been inhabited at least since the Iron Age. A castle was probably first built here in the early 1200s to defend the surrounding areas from Viking invasions. The fearsome Norse had raided, settled in and controlled a large portion of the north of Scotland and the Isles between the years 800 and 1266. Dunnottar Castle is one of my absolute favorite ruins. It's located in an incredibly dramatic location on a cliff that juts out into the North Sea, about two miles from Stonehaven. The castle and the area around it were used from Pictish times, before recorded history. It was first mentioned in 681, in the Annals of Ulster, because of a battle which took place here. It is believed the Picts revered the site and considered it sacred. Ring of Brodgar on Isle of Orkney in Scotland is a wonderful standing stone circle. This area is called the "Heart of Neolithic Orkney" and has been designated a World Heritage Site. This ring of stones is thought to date back to around 2500 BC to 2000 BC. It is a true circle with a diameter of 340 feet and originally contained 60 megaliths. Only 27 of these remain standing today. They vary in height from 7 feet to just over 15 feet. They are believed to have been important in the people's religion, ceremonies and relate to astrological alignments, such as the setting sun at Winter Solstice, much like Stonehenge. Glencoe is the site of the infamous MacDonald massacre in the late 1600s. The whole glen is breathtakingly beautiful. The haunting atmosphere from the tragedy which took place here is obvious and easily felt. The glen and mountains are vibrant, brilliant green in late spring and early summer, my favorite time to visit. There are some wonderful walking trails through nature. Neist Point Lighthouse is located on the most westerly tip of Isle of Skye at Durinish, near Glendale. The view out over the sea and the Outer Hebrides is amazing, especially at sunset. The lighthouse was built in 1900 when it was a manned lighthouse. Since then the internal light system has be updated to an automated system that no longer requires daily maintenance. The light is 43 meters above sea level and can be seen up to 16 nautical miles offshore. A very long set of steps and a path lead out to the lighthouse. The walk is 2.2 km or 1.37 miles. I love this view so much I put it on the cover of my calendar for this year. Castle Stalker (Caisteal an Stalcaire) sits in one of the most dramatic and beautiful settings in Scotland, on a small island (or islet) known as Cormant's Rock in Loch Laich, just off Loch Linnhe in Port Appin, Argyll, Scotland. If you're traveling there, it's midway between Oban and Glen Coe. Stalcaire or Stalker means hunter or falconer. Even today in Scotland, deer hunting is called deer stalking. Castle Stalker as seen today is original from the 1400s. But before Castle Stalker, the MacDougall Clan, Lords of Lorn, held a small fort on the islet, which is great for defense, in the early 1300s. The MacDougalls lost this title because they were defeated by King Robert the Bruce at the Battle of the Pass of Brander in 1308. They regained the title and lands after 1328 and held it until around 1388 when the Lordship of Lorn passed to the Stewarts along with the site where Castle Stalker sits. Most sources state that Castle Stalker as seen today was built by Sir John Stewart, Lord of Lorn, in the 1440s. The castle was built by expert stone masons who constructed parts of the walls nine feet thick. Callanish Standing Stones on Isle of Lewis. This site is beautiful, atmospheric and mystical just as I'd imagined from all the photos I'd seen of it over the years. Carbon dating has shown that Callanish is older than Stonehenge. These megaliths were erected between 2900 and 2600 BC. It is believed that people lived here as far back as 3000 BC. Sango Bay, Durness. The first time I saw the beach at Sango Bay, I absolutely fell in love with it. This is on the north coast of Scotland, looking out over the North Sea. The weather here is often tempestuous and cold with lots of wind. The landscape is rough and rugged. I love the wild, untamed feeling, the scenic beauty and the solitude. Sunrise over the North Sea as seen from Stonehaven. I treasure the bright, vivid colors of any sunrise or sunset. Every morning in Stonehaven, we woke up to a brilliant sunrise out our window. The town is wonderful, friendly and charming. Dunnottar Castle is closeby, within walking distance if you don't mind a two plus mile hike. 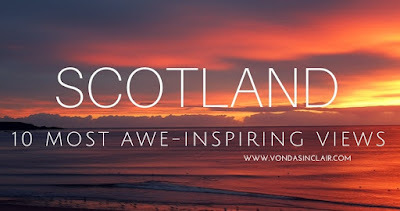 I hope you've enjoyed seeing my favorite, most awe-inspiring views in Scotland. If you were in Scotland, which place would you choose to visit first? Thank you for checking out my post! If you liked it, please share. I appreciate the help! HOT SILVER NIGHTS - Pre-order Now! Spring has Sprung! --Remember to Spring Forward! You're invited to a party! Come win a prize! !